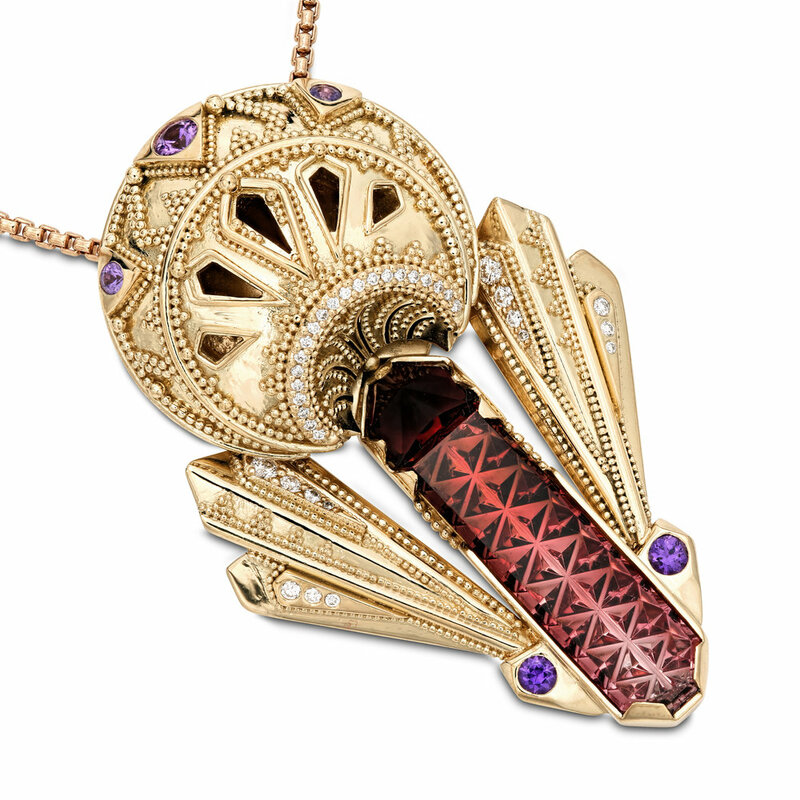 Sarah Williamson’s breathtaking necklace, called “Unfurl Rebel Jewel,” was created specifically to enter the Saul Bell Design Awards and rightfully so. It won First Place in Gold. No design was made for this piece. She just began creating around the center stone and let the piece unfold …. or unfurl. I used 18k yellow gold. The main stone was a gemstone from my collection, a Brazilian Cruzeiro tourmaline. It was cut by Dalan Hargrave. There was an internal fracture near the termination of the crystal, so Dalan cut them into two separate stones. The gradient change in the color of the tourmaline was perfect for this piece and I decided to set the smaller darker stone upside down so it would work better with the pendant. Purple sapphires and Canadian diamonds accent the piece as well. I fabricated the piece, alloyed the metals. The entire pendant was fused until the very end when a few pieces were soldered. Ideas are always floating around in my head; several ongoing projects at any given time. Ideas may stay here for many years until an attempt to bring them to reality is undertaken. This particular piece began with the stone and was designed around it. I was inspired by a trip down the Oregon coast this past fall and the many bridges along the way. My other inspirations were art deco and Mosque ceilings. Ten days or approximately 120 hours. I slept in my studio for the last three days. My piece was submitted at the deadline of midnight. When the deadline was extended, I added some more granulation and diamonds. Learned how far I could push myself. Sometimes I second-guess myself when I am designing, and a lot of time is taken up with that back and forth process. With this piece, there was no time to spare and no time to second-guess myself. I had to make quick decisions and be confident they would be the right ones. Usually my ideas marinate for a while, and this time I didn’t have that luxury. Yes, the piece will be for sale. Stylistically, not necessarily. Perhaps the scale of the piece will be an influence. Granulation will likely always be some part of my work. Currently, in Grass Valley, California. I am from Fredericton, New Brunswick, on the East Coast of Canada. I was originally somewhat self-taught, eventually I took a few classes. After that I had an amazing opportunity to work/study under Paul Bartnik, a jeweler in Portland, Oregon. Working with a master jeweler like Paul was the most valuable learning experience one could ask for. I learned a lot in a six-month period. I have also studied gem-cutting with Dalan Hargrave and have also taken classes with Kent Raible and Thomas Dailing. I stumbled into it, I had never considered pursuing jewelry making in any way. I love the level of detail and intricacy in jewelry. I love designing. I love the small scale. I thrive in designing and creative pursuits. In addition to jewelry, I enjoy photography and designing custom motorcycles. Paul Bartnik has been a huge influence. Dalan Hargrave pushed me to enter contests. I would be remiss if I did not mention Kent Raible and Thomas Dailing, their advice and support. There are many others whose work I admire. Probably the morning. I bite off more than I can chew/begin on new projects in the mornings. Get distracted in the afternoon, and get lost in my work in the evenings. For my art jewelry and a variety of bridal styles, I go by my name: Sarah Williamson Jewelry. I have a new brand, “Precious Ghost,” which will be launching this summer. Social media!!!!! This allows me to have a direct relationship with my customers. I get to work with amazing people who have been very supportive over the years. Some people have followed me for almost as long as I’ve been making jewelry. Pretty excited. I waited years to enter a competition, and this is the first one I’ve entered. Happy to have my parents joining me at the awards gala in Albuquerque. 18k to 22k yellow gold and working with platinum. Kind of hard to choose favorites. My studio is in downtown Nevada City, California. It is a space I spend long days in, so it has to be well-lit and comfortable. I love living in a small town; everything is minutes away and there are trails that begin outside my studio. The Yuba River is minutes away when you need an escape. Microscope, nakanishi handpiece, engravers block and graver tools are my most used. Hard to have a favorite, there are so many important ones. Storytelling, podcasts and things like that. Silence! WHAT ONE WORD OF ADVICE WOULD YOU GIVE BEGINNING JEWELERS? To really take the time to learn the foundation of making jewelry from scratch. Foundational skills are the building blocks that will make you a better jeweler and help you strengthen your creative problem solving skills. For me, jewelry making is all creative problem solving. You don’t need to invest in expensive tools like a laser welder six months into jewelry making, invest your time first, it will take you further. You can see more of Sarah’s work at sarahwilliamsonjewelry.com, preciousghost.com and paradigmjewelry.com.